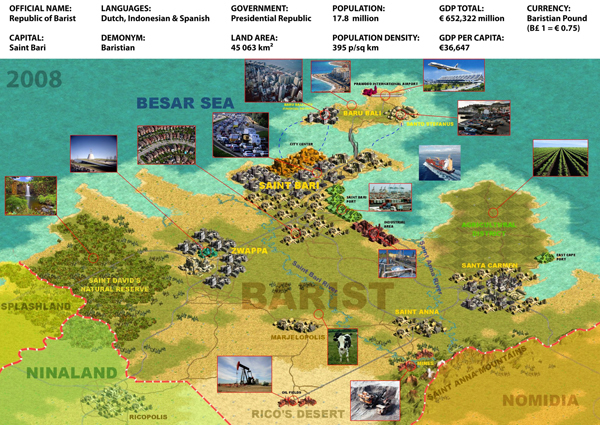 Future Scenario (part 1): Barist, an imaginary country. | J. Ricardo Mejía S.
The coming cases can explain the use of Future scenarios in some projects developed for the author. Design & Engineering: Rodrigues Santos A., Vrijling B., Mejia J.R. (Strategic design & team leader), Güiza Caicedo D., van Houten M., and Heru Prabowo S.
Project date & place: 2008 – 2009 The Netherlands. As part of the context deconstruction (Vision in Product – ViP) within the project “From A to Green” an imaginary country was created as a Future Scenario. The aim of deconstruction at the context level is to try and think about what factors in the original conditions that a product was created for provided a possible reason to produce that particular person product interaction. (Lloyd, Hekker, & van Dijk, 2006) One of the most important parts of this deconstruction consists in the “context analysis” that provides key information to understand the system and the product itself. For the project (from A to Green) of designing the delivery of the future, the context should offer the opportunity to understand the product/need and the space to analyze about the exercise to design for others (instead of just serving himself as a designer). That’s why the team develops a context when it can find some important elements at the same time. The best way to create this context was discovered researching different techniques for Creative Facilitation (Tassoul, 2006). The author of the book suggests combining techniques and procedures in order to generate more ideas in an efficient process. One of these techniques is “future perfect” that is based on storytelling. The term Future Perfect stands for a grammatical tense: that some action will have been fulfilled in relation to a reference in the future. The idea of the technique is that one imagines oneself at some point in the future, often a point at which some innovation has been implemented and then makes up a story how this “present” situation came to be. The best metaphor that represents and illustrates the whole package of characteristics and complexity of the system is an imaginary country as a compact representation of the context. For that reason the team created the imaginary country Barist and represent it in a conventional map of the country and described of its character in two different moments of its history, in the present (2008) and in the future (2025) following the scope of the project. The creation of this imaginary country started with a brainstorming that concluded in some basic information about key elements of the country like name, capital city, language, government, population, area and GDP like the starting point to describe the character of the nation. After the first brainstorming the team defined two aspects simultaneously; the map of the country as a visual representation of its area showing relationships between elements of that space such as objects and regions; and the description of the current situation of the nation in terms of demographic aspects, economy, transportation system and government. 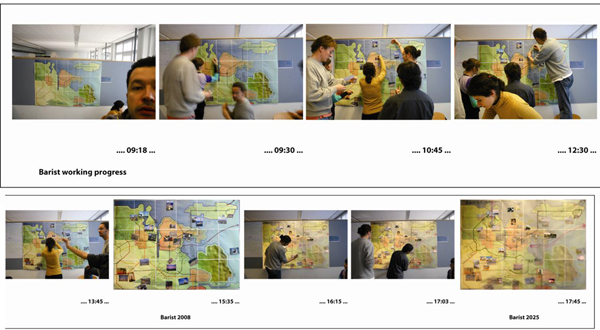 The team was working in a continuous workshop (8 hours long) developing the map of Barist for the year 2008. The starting point was the background (a layout with the basic geographical and political division). The team in a systematic approach started developing the structure of the country, focusing at the same time in cities, transportation system and environmental aspects (natural resources and energy sources). The result of the first part of the exercise was a current (2008) map and relevant information about the country (if you want to read the full text –Barist-2008– click here). After this part of the exercise the team was developed a new layout with the future situation of Barist in 2025 following the factors that the team discovered in a subsequent phase (if you want to read the full text –Driving factors for the future– click here). The work-out consisted in an analysis on how these factors could influence the development of the country trough 17 years, changing the landscape of the nation and the environmental aspects, the profile of the cities and its transportation system. 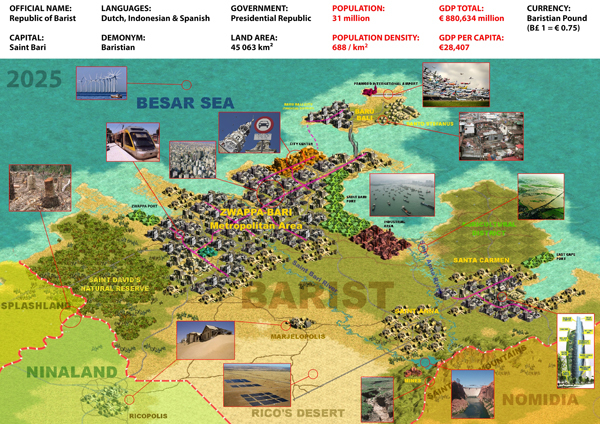 At the end of the exercise the result was a new version of the map of Barist 2025 and a paragraph with the description of the country and its changes (if you want to read the full text –Barist 2025– click here).